A pilot scheme will see free sunscreen available at two city playgrounds in what's believed to be a first for New Zealand. 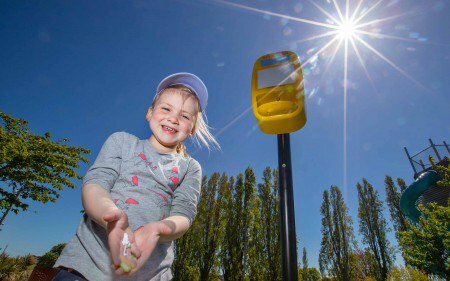 Sunscreen dispensers are being installed at the Margaret Mahy Playground and the Botanic Gardens Playground later this week in a trial being run by the Council’s Parks Team. A third dispenser, for Scarborough Park Playground in Sumner, is planned. The sunscreen will be free for people to use at the parks and will not cost the Council because it’s provided by SkinCan NZ - a group that's passionate about reducing New Zealand’s high rates of skin cancer. SkinCan is using sponsorship from local businesses to cover the cost of the sunscreen and dispensers and will take responsibility for filling them, replacing batteries in the units, and any other maintenance. The new dispensers will be launched at Margaret Mahy Playground this Friday at 2pm by City Councillor Anne Galloway. SkinCan was founded by Tony and Leeann Marriott after Leeann lost her brother to melanoma about three years ago when he was 48. The Christchurch couple decided to do something to help raise awareness of skin cancer. They organised Free Skin Check Day for over 50-year-olds through SkinCan with skin specialists at the Canterbury Charity Hospital Trust on Harewood Rd last year. It will be held again this year at the same location this Saturday 27th October. Mrs Marriott is a real estate agent, and says skin cancer is the most common cancer in New Zealand and sun protection is the best prevention strategy. “We discovered that in the United States many local authorities provide sunscreen dispensers at local parks and beaches, so we approached the Christchurch City Council to see if they were interested in a similar scheme here. Council Parks Team Leader Nicky Brown says the trial is an opportunity to provide sun protection to families who might have forgotten to bring their own sunblock or who find it difficult to afford to buy it themselves. The sunscreen units are hygienic to use and will be located away from playground equipment to avoid the cream being smeared over it. They’re filled with SPF 30 Bright Guard Natural sunscreen which has been approved by local dermatologists. The trial will be evaluated and - if successful - dispensers could be introduced at other locations around the city. Any businesses who are interested in sponsoring a site can contact SkinCan.